For Carol Kelly, biking to and from work is a no-brainer: She doesn't have to deal with the notorious Seattle traffic, she can exercise without visiting the dreary gym and she saves money on gas. And, of course, she acknowledges that her swap of a tailpipe for pedals contributes -- at least in a small way -- to tackling climate change. "I don't necessarily connect it to climate, but it's a bonus," said Kelly, 47, a fine arts professor at Seattle University, as she waited on her bike at a stop sign Friday evening in the Green Lake neighborhood of Seattle. "The planet is going to burn up. If everyone were on bikes, it wouldn't be as much of a problem." Biking, walking and other active forms of transportation are just a few ways that reducing our use of fossil fuels may benefit not only the planet but also our health and the economy, according to a study published in the Journal of the American Medical Association on Monday -- to coincide with the United Nations Climate Summit in New York City. The new study also unveils the latest predictions for heat waves resulting from climate change in the decades ahead. "It's getting hotter," said Dr. Jonathan Patz, director of the Global Health Institute at the University of Wisconsin, Madison, and lead author of the new study. "And it's the extremes that matter most to public health." Even a small shift in average temperatures, say an increase of 2 degrees Fahrenheit, can result in a large jump in the number of extremely hot days. 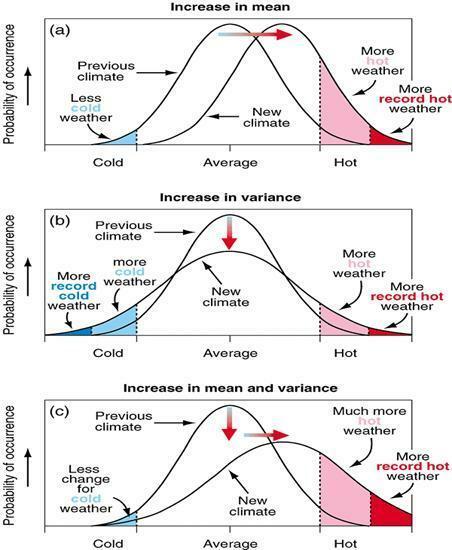 Add in the extra variability in temperatures predicted with climate change and those dangerous extremes may become all the more frequent, as illustrated by the Intergovernmental Panel on Climate Change. U.S. cities including New York and Milwaukee, for example, could see three times as many days above 90 degrees by midcentury, according to the new study, which combined information from over 13 different climate models as well as data from the National Oceanic and Atmospheric Administration. By that time, Dallas is expected to face twice as many 100-degree days. "But this is not a bad news story," emphasized Dr. Howard Frumkin, dean of the University of Washington School of Public Health and co-author of the study. "There are a lot of things we need to do in tackling climate change that will also help in making us healthier, reducing costs and helping us have fun." Reducing cases of heat stroke may be one obvious benefit of cutting our carbon emissions. The annual death toll from extreme heat is already on the rise, according to a report released by the U.S. Centers for Disease Control and Prevention in June 2013. The CDC predicted the number of heat-related deaths would climb from the current annual rate of around 700 to between 3,000 and 5,000 by 2050. Stroke is not the only health concern when temperatures rise. Patz previously studied a heat wave's effects in Milwaukee and saw an increase in the number of children and elderly people hospitalized for suicide attempts, as well as kidney disease and diabetes, probably related to dehydration. Smog can also intensify, as high temperatures speed up the formation of ozone and other airborne pollutants. A warming planet, according to the new study's authors, also creates a host of other health threats beyond just heat, such as the proliferation of infectious diseases, decreased food production, greater use of pesticides and more frequent extreme weather events such as hurricanes and droughts. And the price people pay is more than physical, they note, pointing to the rising mental health issues and social upheaval now associated with climate change. "Some of these indirect issues like long-term droughts, ecosystem failures or the acidification of oceans and its effect on fisheries are hard to pin down, but could really swamp the more direct impacts we talk about," Patz said. He underscored the increasingly recognized role of climate change in war. Perhaps the greatest overall threat to public health in developed nations including the U.S. is an epidemic of chronic disease, added Patz. Diabetes, heart disease and childhood asthma are conditions taking a particularly heavy toll on our health and the economy, with obesity and lack of exercise likely factors. "These are rising at the same time as awareness grows of climate change as a global threat that needs to be addressed immediately," he said. "When you look at those two converging trends, it presents a golden opportunity." The value of health benefits from improved air quality alone could outweigh carbon policy costs in the U.S. by up to tenfold, according to a separate study published in August. Expanding the development of clean energy, planting more trees in urban spaces, and creating sustainable food systems with less production (and consumption) of red meat are among the strategies highlighted in the paper that could both benefit public health and slow climate change. "There are many reasons why it just makes sense to replace our old, dirty ways of getting energy with clean new ways," said Katharine Hayhoe, director of the Climate Science Center at Texas Tech University, who was not involved in the study. "Our health is one of the most important reasons." And medical professionals, the authors add, could be leaders in this effort. The health care sector represents about one-fifth of the U.S. economy and contributes about 8 percent of the country's greenhouse gas emissions that drive climate change. "If we can get health care to be early adopters of renewable energy strategies, we could have an impact on the entire U.S. economy -- and move it toward a low-carbon path," said Gary Cohen, president of the nonprofit Health Care Without Harm. Cohen, who was also not involved in the new study, suggested that health care professionals, who are generally highly trusted by the public, could also use their voices "to countervail against the fossil fuel industry and speak about these core health issues." Even individual doctors and nurses can deliver important advice to their patients, added Frumkin, such as to insulate homes to reduce energy costs and greenhouse gas production, and to become more active outdoors -- including limiting the use of cars when active forms of transportation are options. "Biking can reduce the risk of everything from heart disease and cancer to osteoporosis, gall bladder disease and depression," he said, adding that it has a dual climate benefit since one-third of greenhouse gas emissions in the U.S. are related to transportation. Of course, there are some risks to biking. Kelly recalled almost getting hit by a bus on the streets of Seattle. Frumkin agreed that U.S. cities have a ways to go before getting on par with their European peers. Then again, there are also risks to not biking. "Riding in a car is a pretty risky thing, too," Frumkin said, "from car crashes to the forgone opportunity for physical activity."